NASHVILLE — An effort to enact legislation allowing disgruntled residents in some areas of Tennessee cities to vote to secede is dead for the year. After taking the bill off notice, bill sponsor Rep. Mike Carter, R-Ooltewah, denounced lobbyists for municipalities. "I didn't have the votes," Carter said Wednesday of the bill which had been scheduled for hearing in the House Local Government Subcommittee. "Citizens united together from home is wonderful, but it can't overcome hundreds of thousands of dollars and lobbyists making threats against standing members." 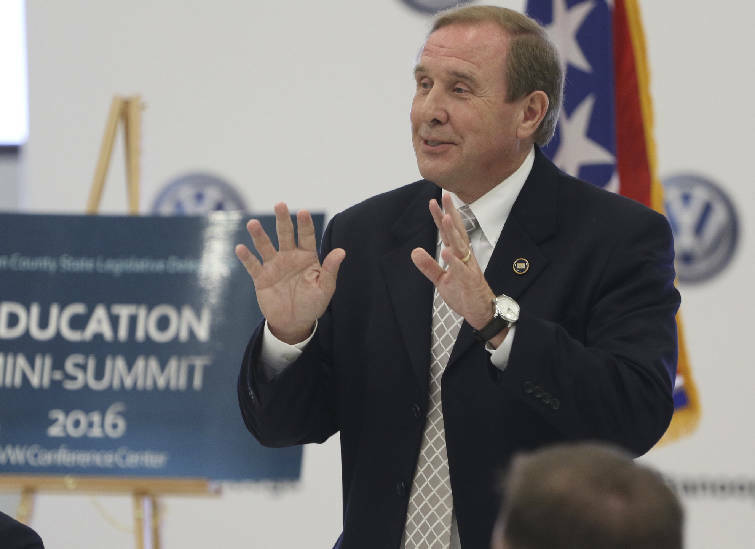 Rep. Mike Carter speaks during the Education Mini-Summit 2016 at the Volkswagen Conference Center on Sept. 20. Last year, Sen. Bo Watson, R-Hixson, got a watered-down version of the bill through the Senate. It allowed disgruntled residents of areas annexed since 1998 to vote in a referendum to leave a municipality. But the bill also had requirements the residents continue paying some taxes with regard to bonded indebtedness incurred by the municipality when they were still living there. In 2014, Carter and Watson upended decades-old Tennessee municipal annexation law by barring cities and towns from acquiring new territory by ordinance. The de-annexation measure was a follow up. The legislation put the Tennessee Municipal League of towns and cities on their heels as did the proposed de-annexation follow through effort. But the TML and allies managed to shape aspects of last year's Senate de-annexation bill and apparently had more success among subcommittee members. "Today, the farmers and the people of Tennessee were denied their right to vote," said Carter, who intends to push the issue next year when the new 110th General Assembly takes office. He thanked two of the subcommittee's members, Rep. Dan Howell, R-Georgetown, and Rep. Tim Wirgau, R-Buchanan, for their support.